“(5) Have this mind among yourselves, which is yours in Christ Jesus, (6) who, though he was in the form of God, did not count equality with God a thing to be grasped, (7) but emptied himself, by taking the form of a servant, being born in the likeness of men. (8) And being found in human form, he humbled himself by becoming obedient to the point of death, even death on a cross. (9) Therefore God has highly exalted him and bestowed on him the name that is above every name, (10) so that at the name of Jesus every knee should bow, in heaven and on earth and under the earth, (11) and every tongue confess that Jesus Christ is Lord, to the glory of God the Father” (Philippians 2:5-11, ESV). This article is from the Reprints of the Original Watchtower and Herald of Christ’s Presence, R1057-1058. “He must reign till he hath put all enemies under his feet.” …”And he shall rule them with a rod of iron.”…”God hath highly exalted him, and given him a name which is above every name, that at the name of Jesus every knee should bow…and every tongue should confess that Jesus Christ is Lord, to the glory of God the Father.”—1 Cor. 15:25; Rev. 2:27; Phil. 2:9,11. Christ’s Millennial work will not consist simply in drawing men’s hearts by love, through a knowledge of the truth; it will be more than that: it will be a ruling with an iron rod—with unbending justice, as well, over any disposed to be rebellious against the rules of righteousness then in force. Such will be forced to comply with law and order. The perverse and obstinate will be roughly handled if they attempt resistance. Nothing will be permitted to hinder the divine plan for growth in grace, knowledge and love, and advancement toward perfection under earth’s new government. But this forced submission, in which every knee will be forced to bow, and every tongue be forced to confess, will be very different from the drawing of men’s hearts which will be progressing at the same time. Hearts are not forced—they cannot be: God has made them free, in his own image. While the whole world will be compelled to render outward obedience to the laws of Christ’s Kingdom, those only will be approved of God who do so willingly and from the heart. And only such as submit to the drawing influence of the truth, and render willing obedience from the heart,—who hate sin and love truth and righteousness, will be admitted to the everlasting life beyond the Millennium. It is this class which in the close of the Millennial reign will be addressed in the words of our Lord as foretold: “Come ye blessed of my Father, inherit the kingdom [of earth] prepared for you from the foundation of the world.”—Matt. 25:34. That there will be some who after being forced to bow in submission will remain enemies at heart and require finally to be destroyed, is evident from the words, “He must reign until he hath put all enemies under his feet.” That the significance of this expression is not conversion, but destruction, see Rom. 16:20. The same lesson, that all who will not conform willingly, to the law of love to God and man, during that age of fullest knowledge and ability, and help, will be counted enemies against God, and against the law of his empire, and no longer coerced, but destroyed, is taught in the symbolism of Rev. 20:10 heretofore explained (March ’88 TOWER) and also in the sentence of the “goats” (“enemies”) in Matt. 25:41,46;—expounded in our June issue. Thus we see clearly the meaning of those passages of Scripture which teach that force will be employed during the Millennium. And we can see that the force will not in the slightest sense interfere with man’s God-like quality of free will, with which God endowed him, and which he has always recognized in dealing with him. How many will then choose life, by choosing and loving righteousness and obedience to God, we cannot judge from the conduct of the majority now, who love sin rather than righteousness. We should remember that they do not now know God, not yet having seen the height and depth, and length and breadth of his loving plan for human salvation, as we do,—as it will be finally wrought out through Christ. They are blinded by the misrepresentations of Satan, and prejudiced by their perverted judgments and tastes which often make good to appear undesirable and evil to appear desirable. When in the Millennial age, the whole truth regarding the pleasures of sin and its consequences, and concerning the joys of righteousness and its results, are fully understood by all, and when all are granted a choice, each will decide for himself which is his choice; and though the Judge can read their hearts and know their choice and could decide thus, their future fitness or unfitness to pass beyond the Millennium, through the portals into the everlasting and perfect state, yet he will make a test so searching and thorough as to prove and make manifest the hearts of all to all, as shown in Rev. 20:7-10. But we must remember that the saints are not samples representative of the whole race, but of those only who do love and obey, and rejoice in righteousness. Our feelings represent those of the “sheep” of the next age, and not at all those of the “goats.” Love of sin, while largely attributable to ignorance and weakness, as we have shown, is not always the result of these conditions. One notable illustration of love of sin, even while possessing full knowledge and power, is seen in Satan. With full knowledge he has not only sinned himself, but has spread sin among others; even lying and deceiving so as to get some into sin who do not prefer it; and with the full power of his unimpaired organism, after thousands of years of experience, he still prefers and clings to sin; and when granted liberty at the close of the Millennium, he will, as God has shown in Scripture, be of the same mind—preferring sin to righteousness; until finally, having served God’s purpose even while fighting against God and righteousness, he shall be cut off, annihilated, with all who similarly love error and sin more than truth and righteousness. To us who love righteousness, it seems reasonable to suppose that a large majority, when granted full knowledge and ability for choice, would choose and love righteousness; but we know of nothing in Scripture which would serve to show the proportionate numbers of the righteousness-lovers and the sin-lovers, except one item in the parable of Matthew 25:33;—the likening of the two classes to sheep and goats. The fact that the sheep are more numerous than goats, and that these were used by our Lord to represent the two classes among men in the next age, seems to teach, in agreement with our judgment, that the obedient will out-number the disobedient in the close of the Millennium. Even if the number then accepted by the Judge, as worthy of everlasting life, should be less than one half of all the children of Adam, it could be no reflection against the wisdom, or love, or power, or justice of that one whom God has appointed the Judge of all,—to any who have the proper Scriptural view of the case. The supposition of some, that human salvation is a matter of contest between God and the devil, as to which shall get the majority on his side, much like the contests between ward-politicians seeking for votes, is a miserable misconception, born of old-time errors; and its fallacy we trust is clearly discerned by our readers. So far as God is concerned, there is no contest,—there has been none, and will be none. So far as Satan is concerned he may, and no doubt does, consider it a contest; an opposition and defiance of God; but like that of Pharaoh, the result will prove that his temporary success was permitted only because the divine plans could thereby be forwarded. In creating our race, God was seeking such creatures, and only such, as would love his law of righteousness, and delight to serve and obey so great and grand and infallible a law-giver. In order that their service and love should be voluntary, they must be created free to obey or disobey; as free to love sin as to love righteousness; and they were so made in his own likeness; and their love of, and obedience to, righteousness must in the end be the results of preference for the tendencies and fruits of right doing, as we may presume it is with God. The condemnation of all mankind to death, by the failure of the first man Adam, left room for mercy, and they were redeemed without cost to them—at the cost of another, who willingly paid their debt and became Judge of all in the new trial, which his sacrifice (in accordance with God’s plan), provided for all. The trial of the world, during the Millennium will not be a trial of strength, or a struggle for mastery, between God and the devil; on the contrary, the devil will be bound, so that there could be no such competition. God does not compete with any one; if it were a competition of power, who could withstand Jehovah’s power? The binding of Satan shows that in such a matter competition would be out of the question. But it is not God that is to be on trial during the Millennium—to test his power, whether he could coerce man’s will. Jehovah did not appoint our Lord Jesus as Judge to try Him (Acts 17:31). Quite the contrary: God’s course, in condemning man as unworthy of life, is already justified (Rom. 3:19); it is man that will be on trial—the race, every member of which has been condemned once, as sinners worthy of death. 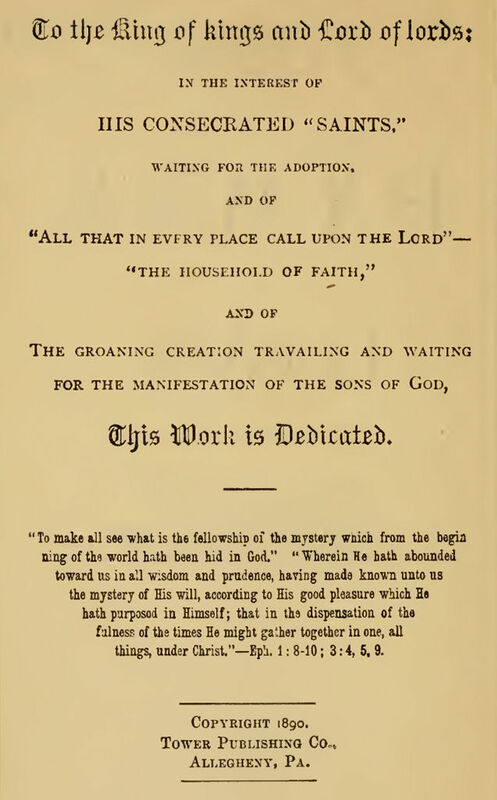 It is a new trial granted to these through their Redeemer—to test how many of them, when granted full opportunity (with the advantage of full knowledge and experience), would prove their love of God’s law by their willing obedience; in order that such, and such only, be they few or many, might enjoy forever the blessings which God provided for such only;—for such as love him and rejoice in his laws. Full of pain and sorrow, though it often is, the few years of dying which we sometimes call the present life, is really a boon, a favor from our Creator; even if he had made no provision for us in the future. This is evident from the effort with which every animal creature, as well as man, clings to the brittle thread of vitality. And the fact that in great mercy God has provided an everlasting future for a class of humanity who when “drawn” shall willingly come into full harmony with him and his righteous laws, is certainly not a proper ground-work for reasoning that it would be a slur against God’s wisdom and power, that all will not receive his gift of everlasting life upon his reasonable and gracious terms. Nor should the fact that God has provided, through an all-sufficient ransom price, for a full and impartial offer to all of this gift, upon his terms, be construed as in any sense obligating him for the failure of those unwilling to accept his gift upon his terms. God’s wisdom and foreknowledge enabled him to foresee that all will not accept everlasting life on his terms; and this fact he has pointed out to us in the Bible. The article above can be found here: Harvest Truth Data Base, http://www.htdbv8.com. Who Is the World’s RANSOM?